Dates of minor superwave arrivals based on observations of ionized neon gas clouds in the Galactic center. At the time of their publication, the discoverers were apparently unaware that in my 1983 Ph.D. dissertation and subsequent publications (e.g., Earth Under Fire, chap. 12), I had predicted a date very close to this for the arrival of a small superwave cosmic ray volley from an outburst of the Galactic core which was one of 13 such dates predicted for the period from 5300 BP to the present; see date prediction table below. I based these on dates for the expulsion of ionized neon gas clouds from the Galactic center which came from the observations of Lacy et al. (1980). To get these expulsion dates, Lacy et al. first measured the diameter of each neon cloud. To calculate a cloud’s diameter they measured its angular size, and figuring the cloud’s distance from us (i.e., the distance between the Galactic center and the Sun since these lay near the galactic core) and using trigonometry, they were able to calculate its physical diameter in light years. Then they measured the cloud’s expansion velocity by observing the Doppler shift of its ionized neon emission lines. Knowing each cloud’s diameter and expansion velocity, they were able to infer its explosion date, i.e., the date when the cloud would have had a zero diameter. In their date calculations Lacy et al. had assumed a galactocentric distance of 10 kpc, whereas I had assumed an Earth-to-Galactic-center distance of 7.06 kpc (i.e., 23,000 light years). Astronomers today often quote the distance to the GC to lie in the range of 7.4 to 8.7 kpc, closer to the distance that I had assumed in my calculations 30 years earlier, although several studies have subsequently agree with the smaller value that I had adopted [e.g., 7.1±1.5 kpc (M. Reid, 1986), or 7.1±0.4 kpc (Olling and Merrifield, 1997)]. I had made the assumption that these gas expulsions were each accompanied by a minor energetic outburst and isotropic release of a cosmic ray volley that traveled to Earth at essentially the speed of light, hence far faster than the gas expulsion itself. I theorized that these cosmic rays would have arrived within days or months of the date that the core eruption would have been visible. Such a superwave would have been energetic enough to account for the spike that Miyake, et al. have found. As we see, the 774 AD C-14 spike discovered by Miyake, et al. falls within 28 years of my 746 AD superwave prediction, hence a confirmation to within the error limits of the prediction. The error bars for the dates are due to uncertainties in knowing the exact diameter of each neon cloud, its precise expansion velocity, and its distance from us. Hopefully more accurate observations of these ionized neon clouds made in the future can reduce the uncertainty of these measurements and allow these dates to be pinpointed more accurately. More recently, Miyake et al. (2013) announced finding another C-14 spike in the tree ring record that dates from 993 to 994 AD. This date coincides precisely with one of the superwave arrival dates that I had predicted; see above table. This C-14 event was of somewhat lesser magnitude, about 70% of the C-14 rise produced by the 774 AD event. They also report beryllium-10 peaks correlating for both the 774 AD and 993 AD events seen in an Antarctic ice core and suggest that these peaks could be due either to a very large solar proton event (SPE) or to a gamma ray burst. Whereas they had previously ruled out a super SPE due to the lack of any extinction episode in the geologic record, here they have reversed their decision and consider it as an alternative due to the frequency of the events they are finding. Here too, they were apparently unaware of my galactic superwave work and hence made no mention of his apriori superwave prediction. With the posting of this news announcement, I intend to contact this research group to make them aware of these predictions which may offer a more reasonable explanation for these peaks than the solar alternative. Usoskin et al. (2013) interpret the 774 AD C-14 spike as being caused by a hard spectrum solar proton event of fluence 4.5 X 1010 cm-2, hence about one third of the fluence that LaViolette (2011) had proposed for the event that contributed to the megafaunal extinction at the beginning of the Younger Dryas. However, there is no evidence of a serious threat occurring to human or animal life at that time and no record of a correlating nitrate ion peak in the ice record. So it is highly unlikely that this event or the 993 AD event was due to the Sun. A galactic superwave cause seems more likely. Several other of the predicted superwave events also match up with events registered in the ice record. The graph shown below (Figure 1), taken from a paper by Horiuchi et al. (2009), presents beryllium-10 influx as registered in the Dome Fuji core from Antarctica. 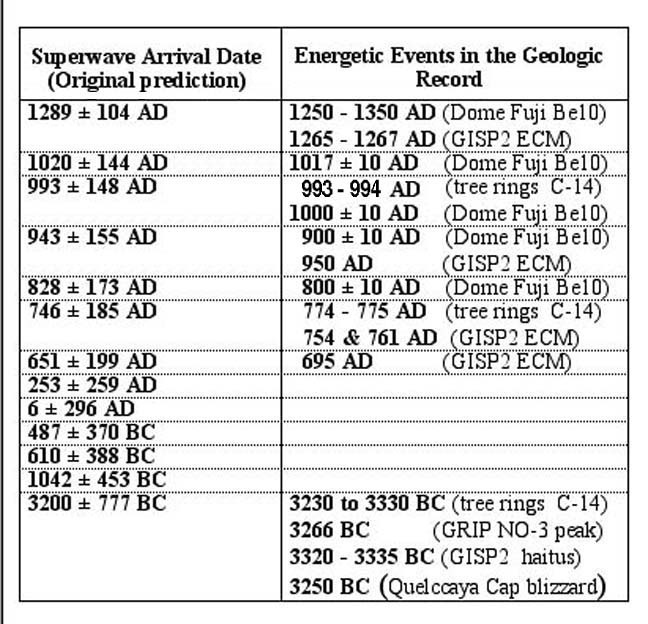 Peaks seen at 1250 to 1350 AD, 1017 AD, 1000 AD, 900 AD, and 780 AD match approximately with the predicted superwave dates 1289 AD, 1020 AD, 993 AD, 943 AD, and 828 AD; see table. 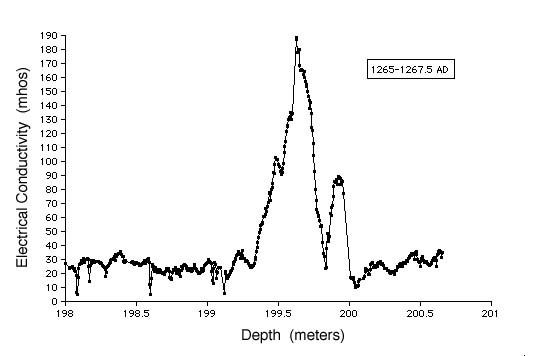 The earliest of these events is recorded in the Greenland GISP2 ice core by a 2-1/2 year long acidity spike that dates from 1265 AD to 1267.5 AD; see Figure 2. This cannot be registering a solar proton event since the particle barrage from such events rarely lasts more than two months. Also no volcanic eruptions are known to have occurred during this period. Acidity spikes are also seen in the GISP2 ice core at dates 950 AD, 761 AD, and 754 AD, which may or may not correspond to the 900 AD Dome Fuji date and 774 AD dendrochronology date. The 950 AD and 754 AD acidity spikes have durations of 8 months and 6 months respectively, so they too are unlikely to be due to solar flares. Also an acidity spike of one year duration is seen in the GISP2 ice record dating at 695 AD and which may be registering the 651 AD superwave. Again, due to its long duration, it is highly unlikely that this event is due to the Sun. Motizuki, et al. (2009) have found a beryllium-10 peak in the Dome Fuji ice core dating about 1010 ± 10 AD that has a duration of about 4 years. They suggest that it may correlate with the 1006 AD supernova explosion which occurred at a distance of 2.2 kpc from our Sun. However, a gamma ray burst from such a type Ia supernova should have had a duration of no more than a few days, and certainly should not have produced a four year peak in beryllium-10. So a galactic superwave appears to be a better interpretation. Motizuki et al. also found brief peaks which they date at ~1060 ± 10 AD and 1070 ± 10 AD. They associate the earlier with the 1054 AD Crab nebula supernova and the later as being produced by unidentified source. Whether these two peaks were produced by superwaves associated with the 1020 AD superwave is left to future determination. Figure 2. 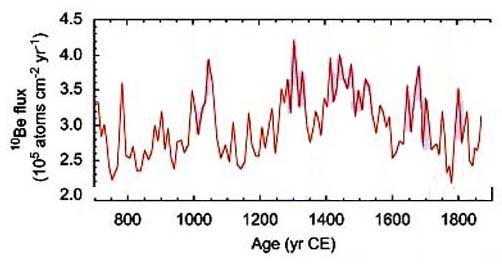 Acidity spike in the GISP2 ice record lasting two and a half years dating 1265 AD to 1267.5 AD. In addition to the above there is a beryllium 10 spike seen both in the Vostok, Antarctica and GISP2 ice records as well as in the tree ring records which lasts about one century and is centered at a dendrochronology date of 3280 BC. This 3300 BC superwave date confirmation is one that I had called attention to some years back. This same event is also registered in the GRIP Greenland ice record by a fairly sizable nitrate ion peak centered at 3266 BC. The whole period from 3390 BC to 3250 BC exhibits elevated acidity in the GISP2 record indicative of a period of high cosmic ray activity. Presumably it had a very large effect on the GISP2 ice record at this time because ice core researchers have omitted data between depths 1030.1 meters and 1032.4 meters corresponding to the dates 3320 to 3335 BC, either because they felt the values were so extreme as to be untrustworthy or because of fracturing of the ice record in this depth range. Also glaciologist Lonnie Thompson had found evidence of abrupt climatic change occurring around 3250 BC (accelerated ice formation in Peru and a dry spell in Africa). In all, we have noted here that 8 of the 13 predicted superwave events have corresponding anomalies in the terrestrial record indicative of periods of high cosmic ray exposure. The five events predicted to have occurred between 1042 BC and 253 AD have yet to be verified. A search for them in the dendrochronology record or ice core profiles is highly advisable.